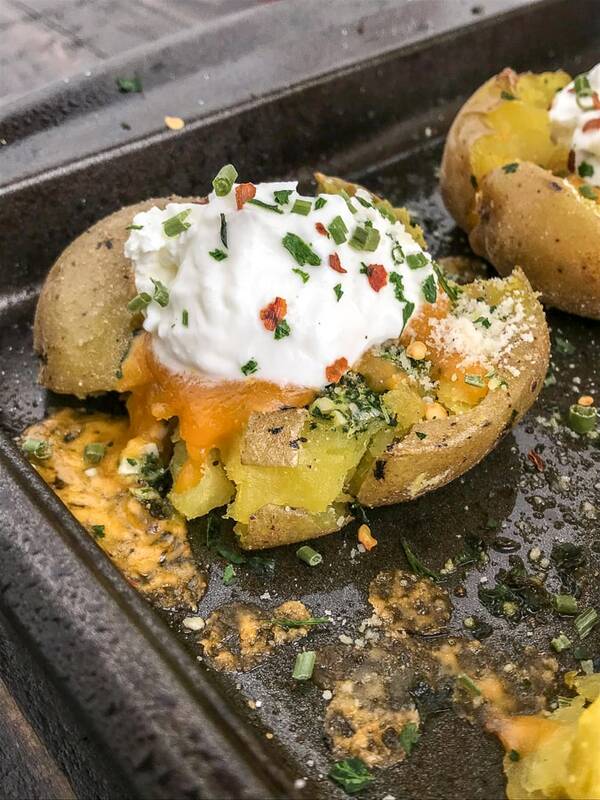 Crispy Loaded Garlic Smashed Potatoes – potatoes baked with garlic, parsley, onion powder, parmesan cheese, and butter. Crispy deliciousness topped with cheddar cheese, plain Greek yogurt, chives, and red pepper flakes. 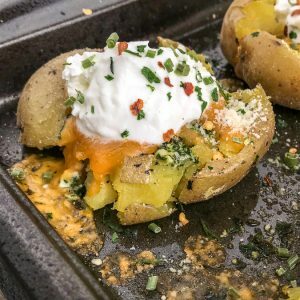 Better than the traditional baked potato, easy to make, and truly the best way to serve potatoes if they are not in fry form! 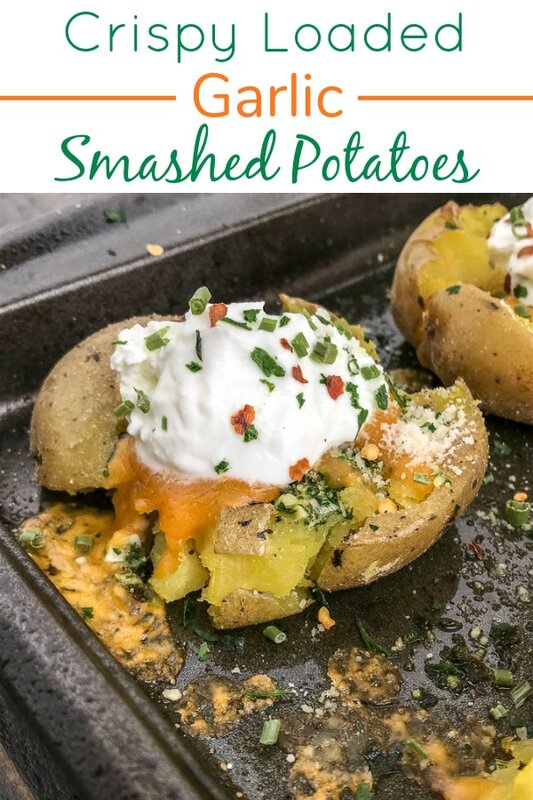 These Crispy Loaded Garlic Smashed Potatoes are crispy and cheesy on the outside, but warm, soft and fluffy on the inside. Making them the perfect side dish to any meal. Let’s not forget the cheese. ❤ The cheddar cheese and parmesan cheese to be exact! Any excuse to put cheese on something – you know I’m going to. It’s a staple in life. How can you not agree after seeing that oozing cheese? Or the crispy cheese on the pan (best ‘extra’ when cooking!)? Raise of hands to everyone who loves burnt or crispy cheese. I know I’m not the only one out there. Kind of like I know I’m not the only one who loves a hot dog a little extra charred from the grill. YUM! The one hot dog a year that I eat. Now, let’s get to the recipe details. These potatoes are so simple to make. Start by placing the potatoes into a pot of salted water and allowing it to come to a boil, letting the potatoes hang out, covered, for 25-30 minutes – until they are fork-tender. But not too soft. Otherwise you will end up with mashed potatoes on your pan. Place them onto a greased sheet pan. I sprayed mine generously with olive oil cooking spray. This helps to keep them from sticking to the pan while also ensuring the bottoms get nice and crispy as well. Another bonus about this easy recipe – no turning the potatoes! It’s important to allow them to be tender enough to smash gently with a fork or potato masher. Don’t smash too hard or quickly, otherwise you will have mashed potatoes on your sheet pan. Mash the potatoes with a fork, potato masher, or even the bottom of a glass or mug. Be gentle with your smashing. For the yummy garlic butter sauce – all you need for this is olive oil, butter, lots of minced garlic, onion powder, and parsley. It’s easier to mix and drizzle the sauce over the smashed potatoes if the butter is melted. You can do this for 15-20 seconds in the microwave or on the stovetop. After you have smashed the potatoes, drizzle them with the garlic butter sauce. You can add as much parsley as you would like to these. I added a bit more (for myself) as I love parsley. Spray the tops with a generous coating of olive oil cooking spray if you want them to be a bit more crispy. I do this with fries and potato wedges. It seems to help in my honest opinion. That’s it! Into the oven they go to crisp up for approximately 10-15 minutes. Simple – just as promised! And who doesn’t love a simple recipe? Life is too short to spend it slaving away over a hot stove. As the heat of summertime gets here – we will all agree to that. Right? Once they’ve had time in the oven to bake and crisp up – add the parmesan cheese and cheddar cheese and place them back into the oven for a few more minutes. Just enough time to allow the cheese to melt. That’s it! 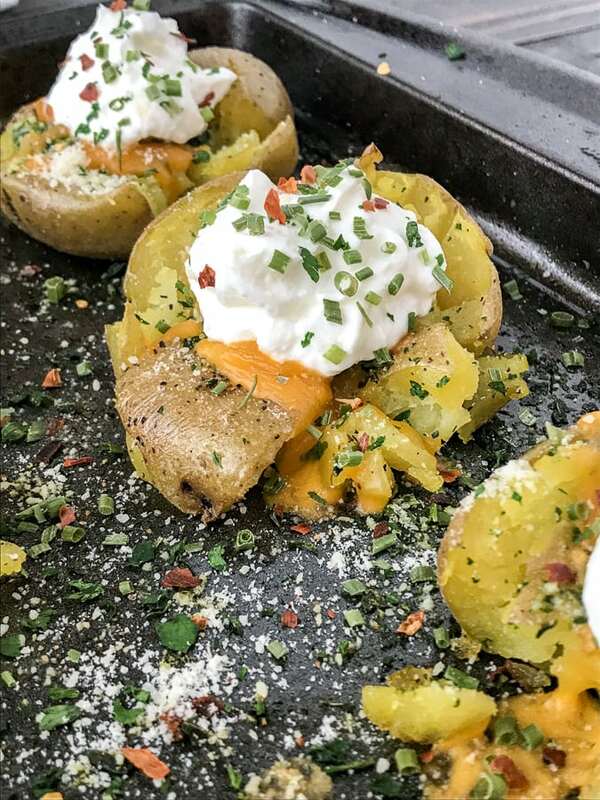 Remove from the oven and garnish with plain greek yogurt (or sour cream), additional dried parsley, chives, salt, pepper, and crushed red pepper flakes. YUM! 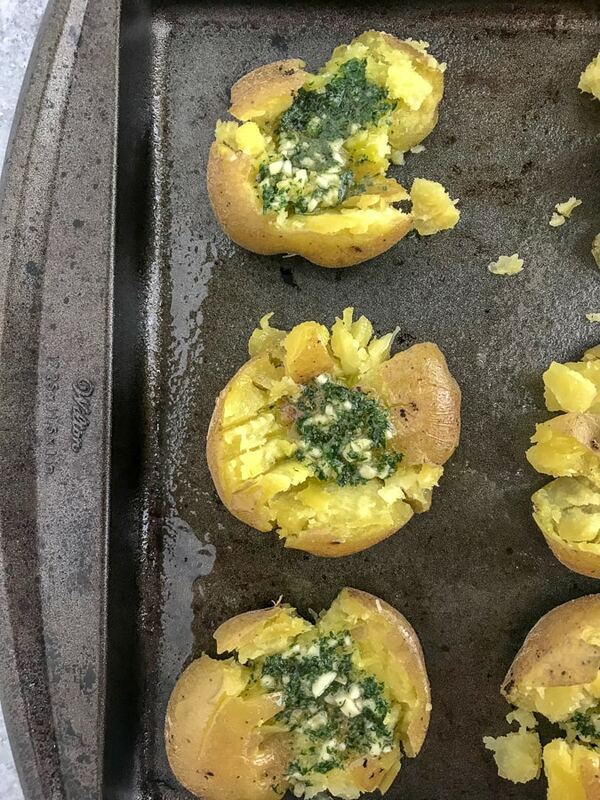 Crispy Loaded Garlic Smashed Potatoes - potatoes baked with garlic, parsley, onion powder, parmesan cheese, and butter. Crispy deliciousness topped with cheddar cheese, plain Greek yogurt, chives, and red pepper flakes. Preheat oven to 400 degrees F. Prepare a sheet pan by spraying it with nonstick cooking spray. Place a large pot of salted water onto your stove over high heat. Add the potatoes and bring to a boil. Once boiling, cover and allow the potatoes to cook for approximately 25-30 minutes. During the last 5-10 minutes, prepare the garlic butter sauce by mixing the melted butter, olive oil, onion powder, and parsley into a small bowl. Whisk to combine. Once the potatoes are fork-tender (but not super soft), remove from heat and drain the water. Place each potato onto the prepared baking sheet. 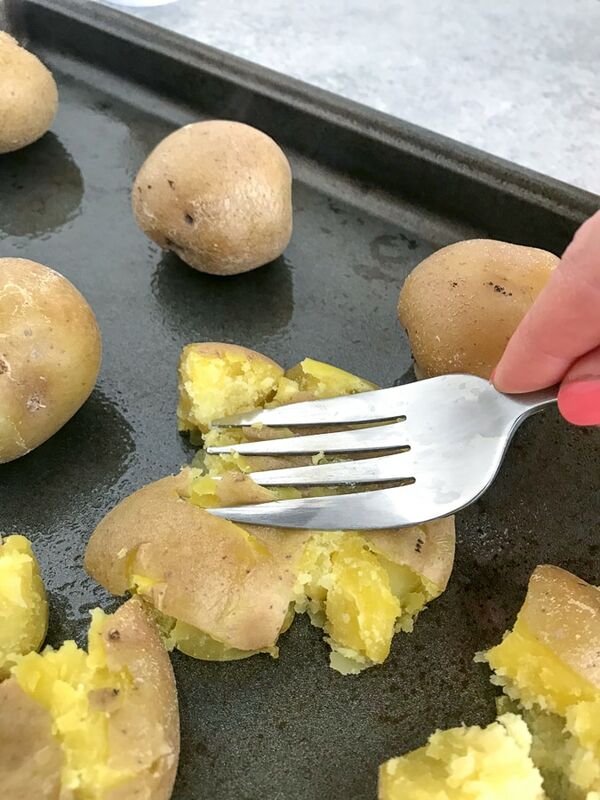 Using a fork, potato masher, or the bottom of a glass - firmly (but gently) press down on the center of the potatoes to smash them. Evenly drizzle or brush the garlic butter mixture over the potatoes. I drizzled with a spoon and then took a brush to make sure each part of the potato was touched. 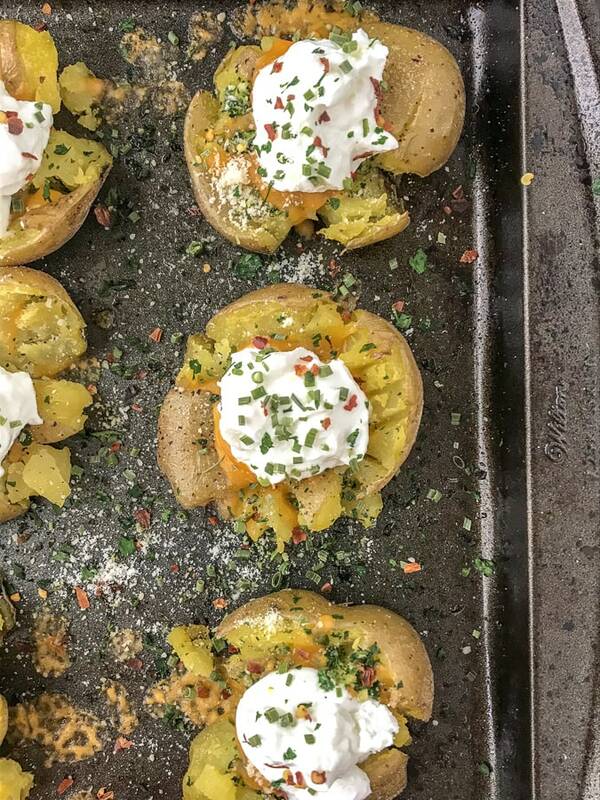 Optional step: spray the tops of each potato with a generous amount of olive oil cooking spray if you want the potatoes to be a little extra crispy. Season with salt and pepper - to taste. Place the sheet pan into the oven and allow to bake for approximately 10-15 minutes. Or until the potatoes appear golden and crispy. Remove from the oven, top with parmesan cheese and cheddar cheese. Place back into the oven long enough to allow the cheddar cheese to melt. Serve immediately. Garnish with plain greek yogurt (or sour cream), chives, red pepper flakes, and a dash of salt (if preferred). You can use any plain greek yogurt: full-fat, 2% or fat-free. Just make sure its plain! This is a healthier substitute to sour cream, but you're more than welcome to use SC instead. If you're feeling extra daring - these are amazing with bacon on top. Crushed red pepper flakes are optional. They will give the potatoes a bit of heat with the flavor, so if you're going to use them - a little goes a long way.